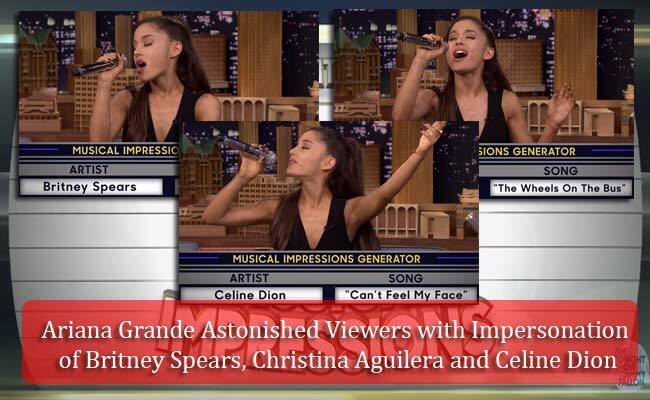 Ariana Grande astonishes viewers and netizens after impressive impersonation of Britney Spears, Christina Aguilera and Celine Dion in The Tonight Show Starring Jimmy Fallon. Jimmy Fallon challenged the young star to a game of random musical impressions and Grande boldly took it up. With the first press of the buzzer, she had to impersonate Britney Spears singing the children’s song ‘Mary had a Little Lamb’. She was able to imitate vocal style. Next, she impersonated Christina Aguilera doing ‘The Wheels on the Bus.’ She surprised the audience with the power of her vocals and her energy of how she imitated Aguilera. Lastly, she did Celine Dion doing ‘Can’t Feel My Face.’ it was at this moment that people seemed surprised and amazed. She was not only able to imitate Dion’s singing style but also her famous accent. Fallon could not contain his laugh. Many left comments saying that Grande showed how talented she could be. Some said that though they didn’t like the style of music, she clip had showed that her vocals and musical skills are great. The clip was posted on YouTube by The Tonight Show Starring Jimmy Fallon and went viral. In just three days, the video was viewed more than 9.5 million views and even got more than 114 thousand likes from its viewers. Ariana Grande is an American singer and actress who was known with her role as Cat Valentine in the series Victorious in 2009 under Nickelodeon. When the show had ended, she was still casted in its spin off show. Grande recently visited Philippines as part of the Asian leg of her tour ‘The Honeymoon Tour’. There are also news that she will be pasrt of the TV series Scream Queens.